I’ll never forget our first piece of aqua opal. It was a Rose Show bowl. I couldn’t believe that anything could be so beautiful. Neither could I believe the price. They had the audacity to ask $75 for it. We thought that was exorbitant, but threw caution to the wind and bought it anyway. 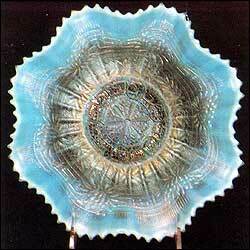 To this day I’ve never been able to resist an aqua opal Rose Show bowl. We now have eight of them. I know it’s ridiculous, but watcha gonna do? While there is still no hard proof that Northwood made the Rose Show, we do know that the great bulk of the aqua opal Carnival was made by that company. The colors in which both the Rose Show and Poppy Show patterns were made point quite convincingly to Northwood. One current theory is that Northwood pressed these pieces, but that the molds may have been owned by another company. The only other company to make much of a contribution to the aqua opal scene was Fenton and their production was very limited. These Fenton pieces are consequently rare and costly. This isn’t to say that Northwood aqua opal isn’t also rare and expensive, but it was made in a much wider range of shapes and patterns. It is also thought by most collectors to be a better aqua opal. The opal is usually much heavier and from an aesthetic point of view, the pieces are more attractive. This color is produced by adding calcium phosphate to the glass mixture. This causes the hottest portions of the piece, which are the edges, handles, etc., to turn white. This hot piece is then sprayed with a mixture of metallic salts to give it iridescence and thus make it “Carnival.” We describe aqua opal as being either butterscotch or pastel. This relates to the color of the iridescent spray that was used. A bronzy, marigold type spray resulted in “butterscotch” aqua opal. A clear spray permitted the aqua opal coloring to show through and thus creating what we call “pastel” aqua opal. 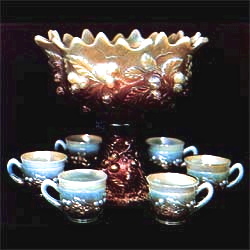 Fenton pieces are usually of the butterscotch type and with less opal. This is apparent by looking at the Fenton pieces shown in Photos 2, 11, 12, 13, and 14. Northwood pieces can also be butterscotch, but they are more often pastel with heavier opal. This is also obvious from the various Northwood pieces shown in the color spreads. Let’s take a look at the pieces pictured on these two pages. PHOTO NO. 1–(Northwood’s Embroidered Mums) This pattern was made in aqua opal only in this ruffled 8 1/2″ bowl. It is a rare one. I can recall only one selling at auction. It brought $660 back in 1980 which was before the aqua opal craze commenced. It is strictly a guess as to what one would bring today. $1,000 may be conservative. PHOTO NO. 2–(Fenton’s Leaf Chain) This is the only bowl known in this color, but two plates have surfaced. They are very rare. 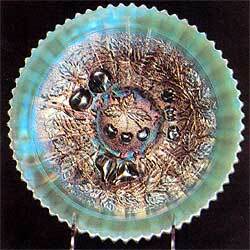 Unlike most Fenton aqua opal pieces, this bowl has super opalescence, but most of it runs down the back side. PHOTO NO. 3–(Northwood’s Grape and Cable) This 8 1/2″ pie crust edge bowl is an excellent example of Northwood’s superiority in this color. In addition to these bowls, a few rare examples of aqua opal Grape and Cable are known in a banana boat, 2 or 3 cracker jars, 3 napkin [hatpin] holders, a powder jar, a few punch cups, and a bon bon. So even though tens of thousands of Grape and Cable pieces are made, a grand total of only some two dozen are known in aqua opal. This gives some idea as to the rarity of these pieces. One of the bowls pictured here brought $900 at auction in November 1983. I have been told it was not a particularly good one. PHOTO NO. 4–(Northwood’s Three Fruits) These collar base stippled plates tend to vary greatly. There are a dozen or so that are super and then there is a larger group which have little opalescence and are much less desirable and valuable. There seems to be no middle ground. The last one of these better plates to sell publicly was at Mrs. Hartung’s estate auction in October 1983. It brought $875. I’m not positive, but I believe all of these pieces are stippled. PHOTO NO. 5–(Northwood’s Good Luck) These bowls are seldom offered for sale. This comes with either butterscotch or pastel iridescence. The pastel, as shown in the photo, seems to be preferred by most collectors. 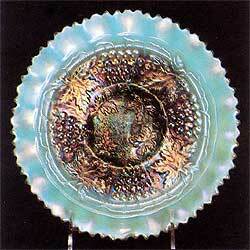 Plates in this pattern were made in a wide range of colors, but none have turned up to date in aqua opal. Finding one would really be hitting the Carnival lottery! PHOTO NO. 6–(Northwood’s spatula footed Three Fruits bowl) The pattern on these pieces is quite different than the one on the collar base bowls and plates. Unlike the other pieces, these footed bowls also carry the Meander as a reverse pattern. They are also much more available. Even so they are still scarce, highly desirable, and will cost you some $350 to $450. PHOTO NO. 7–(Northwood’s Acorn Burrs) This one of a kind punch set, along with the two known Peacock at the Fountain punch bowls in the same color, represents the “top of the Carnival Glass mountain” in my opinion. 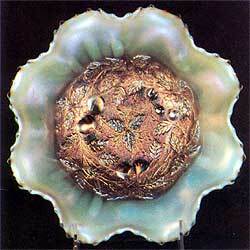 There are reports that another aqua opal Acorn Burrs might exist, but it has never been confirmed. The set pictured here was owned for many years by Mrs. Hartung. We bought it at her estate auction. She had been robbed and most of her Carnival stolen some years before she acquired this set. It filled a void left by the robbery and played an important role in the later years of her life. PHOTO NO. 8–(Northwood’s Beaded Cable rosebowl) There are too many of these to call them rare. They are beautiful and desirable, but more available than the same piece in white, ice blue, or ice green. Even so, they still bring around $250. PHOTO NO. 9–(Northwood’s Fine Cut and Roses rosebowl) It’s a different story with this piece. Not many of these were made in aqua opal. 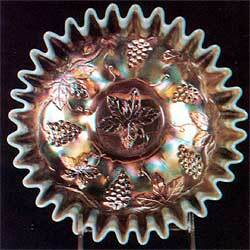 This piece was also made into a footed candy dish by spreading the top while still pliable. It, too, is hard to find in aqua opal, but will sell for only about a quarter of the $800 to $900 that the rosebowl commands. PHOTO NO. 10–(Northwood’s Basket) Like the Beaded Cable and Leaf and Beads rosebowls, this basket is one of the few pieces that can still be quite readily found in aqua opal. White and ice green are also still available, but the ice blue basket is the tough one to find. 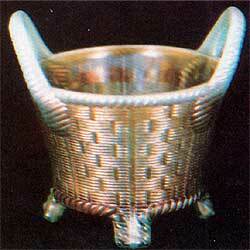 This novelty basket comes in the round shape shown and also in an eight-sided shape. While most colors are available in both shapes, the aqua opal is known only in the round shape. PHOTO NO. 11 AND 12–(Fenton’s 9″ and 7″ Vintage bowls) Even though the opalescence is weaker on these Fenton pieces than on most Northwood’s aqua opal, they are still beautiful and extremely rare. 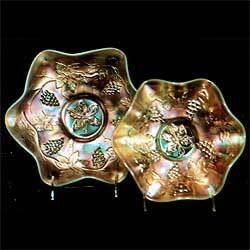 I’ve only seen a couple of each of these two ruffled bowls, but I’m sure there are others. The 8 1/2″ ribbon candy edge bowl shown in PHOTO NO. 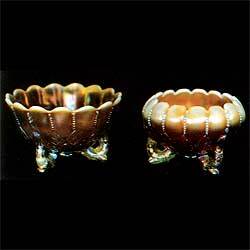 14 is the same pattern and is from the same mold as the 9″ ruffled bowl in Photo 11. The tightly crimped ribbon candy edge adds a lot to the appearance of the piece as well as to the price it will bring. Even so, I have seen a couple more of these than the same bowl in the ruffled shape. PHOTO NO. 13–(Fenton’s Dragon and Lotus) Here again we have a common pattern in a common shape, but in a very rare color. 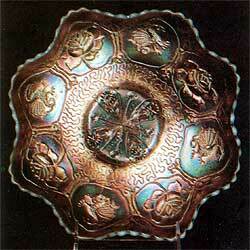 I’m sure there are at least 15 or 20 Dragon and Lotus bowls in red to each one in aqua opal. This gives you some idea as to its rarity. The only one I recall selling publicly was in the Miller-Mogg auction back in April 1981. It brought $600. PHOTO NO. 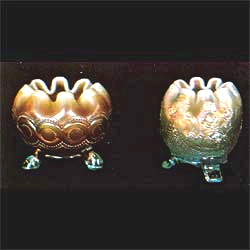 15 and 16–(Northwood’s Leaf and Beads) This rosebowl and nut bowl came from the same mold and were simply shaped differently while still pliable. 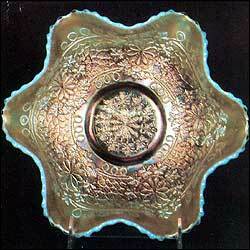 There are too many rosebowls in aqua opal to call them rare, but the nut bowl is another story. Only 4 or 5 of these have been confirmed. I don’t recall one ever selling at auction. The last one to turn up to my knowledge sold privately a couple of years ago. While I can’t show pictures of many of the super rarities in aqua opal, this article would be incomplete without at least listing them. In addition to the pieces already mentioned, here are some others: Ohio Star vase (2 known), Wide Panel epergne (1 known), Poppy Show plate (3 known–some think these are more blue opal than aqua opal), Orange Tree loving cup (1 known), Peacock at the Fountain orange bowl and compote, Northwood’s Peacock and Urn ice cream set, Corn vase, Wishbone footed bowl, Poinsettia footed bowl (1 known), Singing Birds mug, Tree Trunk vase (middle size–none known in funeral size), and Northwood’s Strawberry bowl (1 known). I am often asked if the aqua opal “binge” is for real or only a passing fad as we have seen happen before with certain colors and shapes. Since the supply is so limited, I have to feel it is for real. Most of the super rarities tend to become locked into collections and are seldom offered for sale. Even those that are still available are certain to become harder to find and will probably never sell for much less than they are bringing today. 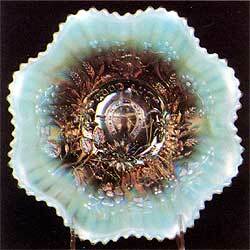 If we are to describe any Carnival glass as “museum quality,” I expect it would be some of these aqua opal pieces.